We know this time of year can be full of so many things for people, both celebratory and difficult. At PCA, we hope that you find time and ways to take care of yourself amidst all the hustle and bustle. We are open every day this month, with some slight changes to our usual schedule. 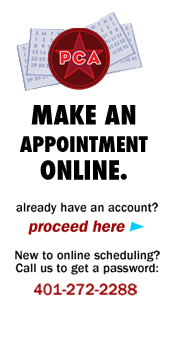 Call us at 401-272-2288 to schedule an appointment for an acunap. If you celebrate any of the many holidays bringing back the light this time of year, we wish you a joyful and peaceful celebration. where would warehouse workers /truck drivers fall under and do you consider librarians educators. We are changing up our occupational specials for 2018 and it’s not yet clear which occupational special warehouse workers and truck drivers would fit with best. Maybe our August special can encompass these occupations in some way, thanks for the suggestion. We’ll post when we decide what August’s special will be. Librarians would fall under the educators heading.